Owned and operated by the Grassa family, Château du Tariquet was built in 1683 with its vineyards bordering Eauze, recognised as being one of the very best areas of the Bas-Armagnac region. Gascony, as the region is known, has soil which is very sandy, acidic and lacking in nutrients, although with high levels of iron. There is also a concentration of silt in the soils there called Boulbènes. The chalky clay-silica and sand soil is known as “sables fauves” and is renowned for its ability to produce rich Armagnacs. All the grapes used at Tariquet are estate grown – they don’t buy in any spirit or wine. Worldwide sales for products in 2012 stood at 8 million bottles of wine and 120,000 bottles of Armagnac. Out of the estates 900 hectares there is are 100 hectares dedicated to Armagnac grapes which include Ugni Blanc, Baco, Folle Blanche and unusually also Plante de Graisse. Of these four Folle Blanche accounts for 25 hectares of the vines for eau-de-vie production and is the largest area of Folle Blanche vineyards in Armagnac. 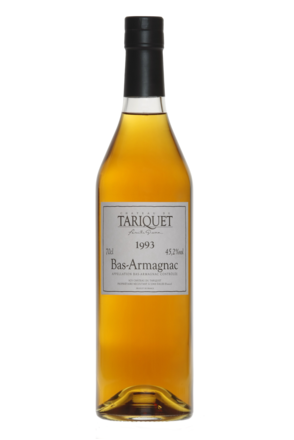 Tariquet Armagnac is specialised in the Folle Blanche grape, which is notoriously difficult to grow and requires a lot of care and maintenance. Tariquet’s Blanche product as well as their 8, 12 and 15 year olds and the 5 Barriques Hors D’Age are all made using 100% Folle Blanche. On the other hand Plante De Graisse is particularly rare to see in Armagnac, despite being one of the ten grapes approved for Armagnac production. Typically only four of the ten are ever used, Baco 22A, Colombard, Folle Blanche and Ugni Blanc. Tariquet started experimenting with Plante de Graisse which was not being used by any other producer. It’s oily and not supposed to be aromatic but they found it was and decided to use it in the Century edition Armagnac. For white wine production they use Ugni Blanc, Colombard, Sauvignon, Chardonnay, Semillion, Chenin Blanc, Gros Manseng and Petit Manseng . For Rose they use Marselan, Syrah and Tannat. The grapes are harvested in September and early October and vinified in the traditional way. The harvest is carried out by machine and the grapes are immediately put into a tank whilst still in the vineyard and covered by carbon dioxide gas to avoid oxidation. Tariquet strives to prevent oxidisation throughout the winemaking process. Once harvested the grapes are taken to the pressing house within three hours of being picked. Tariquet boasts eight pneumatic presses which can take 50 tonnes each and are tailor-made for the estate. When Yves first bought them they were much above the capacity then required but he was correctly anticipating the future, now they are all required at harvest time. The pneumatic presses extract juice much more gently than the old-fashioned screw presses still commonly used by other producers in the region. Tariquet prefers to chill the grapes to 15 degrees before pressing them. Each press is controlled separately and each grape variety is handled separately. From here the juice goes down into a tank for two to three days to allow sediment to settle and then moves to fermentation. This usually lasts up to 15 days. The estate use three to four different cultures of dry yeast depending on the grape variety. Armin Grassa describes it as trying to respect the grape and says different yeasts work better with different grape varieties. 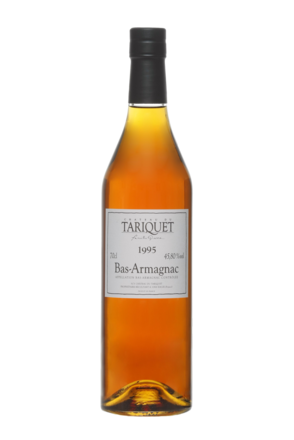 Once the juice is fermenting into wine there is no sulphur added into what will become Armagnac, in fact even in Tariquet’s wine production very little sulphur is added with vitamin c used instead. Distillation occurs during November and December when the first frosts appear. 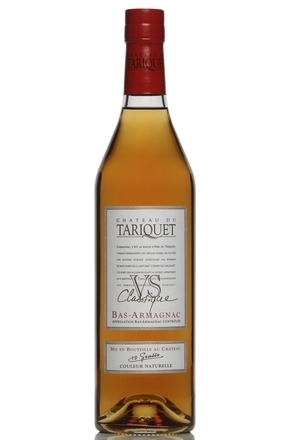 Tariquet use a traditional cooper continuous Armagnac still, called an alembic, which is heated by a wood fire. Each grape variety is distilled individually, emerging as white eau-de-vie between 53 – 56% alc./vol.. Distillation is stopped every 10 days to clean the still. At Tariquet they hold a large feast the day distillation starts, and family and friends gather around the alembic, eating foie gras and other local dishes. The eau-de-vie is first aged in new 400-litres casks oak casks which the French call pieces. Tariquet uses oak from forests such as Vosges Mountains, Nièvre and Allier. The wood is lightly toasted and known as ‘blonde toast’ which marks Tariquet out from its neighbours who use medium or heavy toasted barrels. After a period of between six – eighteen months the eau-de-vie will be put into older casks to stop it becoming too tannic. In the third year the same grape varieties will be blended together again in a large vat and put back into casks. This both homogenises and aerates the brandy. As the Armagnac matures it becomes a deeper shade of amber. When the cellar master or ‘maître de chais’ decides the brandy is ready, several eaux-de-vie are blended together, a process known as ‘coupage’. The Armagnac is blended and allowed to rest and marry for a year in a cask prior to bottling. A mixture of distilled water and Armagnac, called ‘petites eaux’, is gradually added to the armaganc in order to reduce to bottling strength. In Tariquet they take new eau-de-vie, of the same grape variety that is being reduced, and decrease to between 17-19% with demineralized water distilled in the alembic. This mixture is then aged and becomes the ‘petites eaux’. Whilst Tariquet has a modern bottling line for its wines, the armagnacs are still bottled by hand.